The Border Collie originated in Northumberland along the borders of Scotland and England. The word “collie” refers to sheepdogs and is derived from Scottish dialect. Some of the names the Border Collie went by in the past are Scotch Sheep Dog, Welsh Sheep Dog, Northern Sheep Dog, Highland Collie, and Scotch Collie. They are descendent from dogs used by the Vikings to herd reindeer. They became extremely valuable to shepherds. The shepherds improved the breed by breeding the best working dogs to each other. Another nickname for the Border Collie is “workaholic,” as they have a love for working. They are known to have an “eye” that can hypnotize sheep. Their stare wills the sheep to move and run. 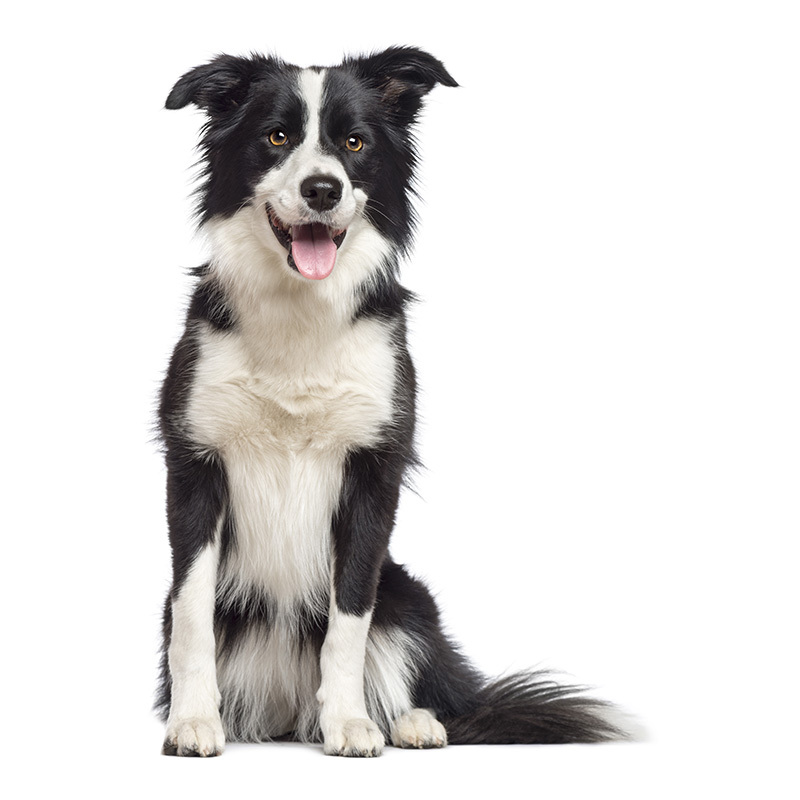 Today the Border Collie is recognized as the premier sheep herding dog, and is one of the most trainable breeds. They serve as narcotics and bomb detection dogs, guide dogs for the blind, police work, and search and rescue. You will also find them flying in the air at Frisbee trials, performing tricks, and excelling at competitive obedience trials. The Border Collie has been called the most intelligent breed in the world! In fact, the question’s been asked when thinking about getting a Border Collie, “Do I really want a dog that’s smarter than me?” They are the type A’s of the canine world. Along with their super intelligence, the Border Collie has an abundant supply of energy. If you don’t give them enough physical and mental exercise, they can become very destructive. These dogs are sweet, even-tempered, and have a permanent will to please. Border Collies are excellent with children, but as with all dogs, parents need to be vigilant to make sure both the children and dog learn how to interact with each other, and because of the Border Collie’s penchant for herding, they might try to herd the children, even nipping at their feet or bottoms. Border Collies are naturally protective of their families and home so they make a good watchdog; however, they aren’t known for being avid barkers. These are wonderful little dogs who will try to please you day in and day out. Border Collies usually weigh between 30 to 50 pounds and stand approximately 18 to 21 inches tall. They are a medium-sized dog with a lithe, wellmuscled build. Their coat is longish and is usually black and white in color. All pure Border Collies alive today can trace their ancestral line back to one dog, a Border Collie named “Old Hemp” who lived from 1893-1901. “Rico,” a border collie study subject, could recognize more than 250 objects by name. Another Border Collie named “Striker,” is in the Guinness Book of World Records as the “fastest car window opened by a dog.” His record time is 11.34 seconds.